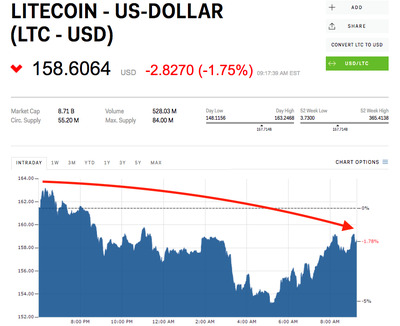 Litecoin is falling after its first hard fork was announced. It will occur next week. 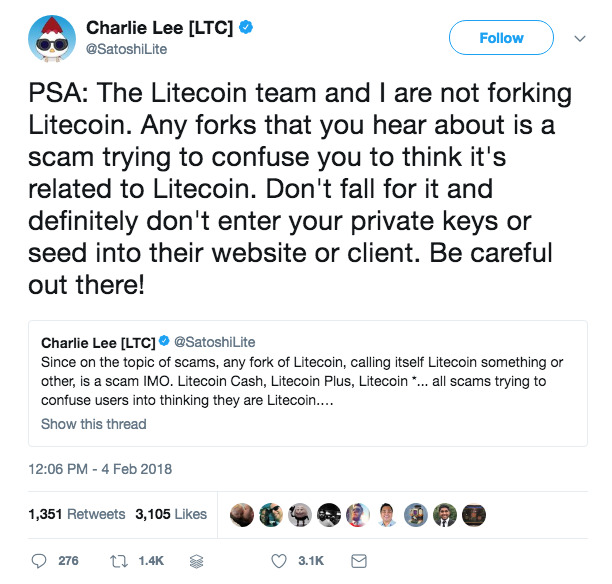 Litecoin cash is not affiliated with litecoin in anyway, and litecoin founder Charlie Lee has warned it could be a scam. 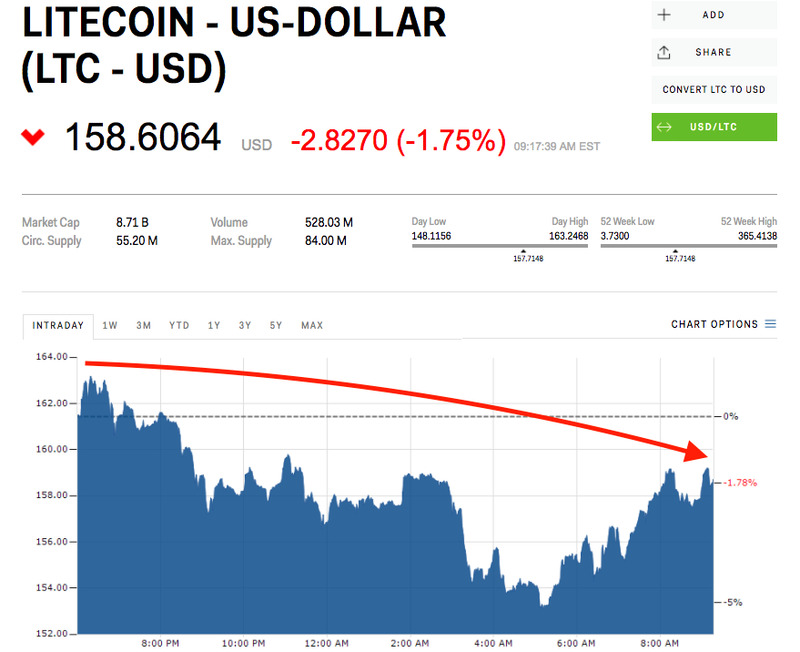 Litecoin is down 2.2% Tuesday morning after the cryptocurrency’s first hard fork, Litecoin Cash, was announced. Litecoin holders will receive 10 tokens of litecoin cash for every one litecoin they own, the newly minted Litecoin Cash foundation said Monday. The goal of the new currency is to increase the “block speed” at which the network can process transactions. The foundation says litecoin cash has a goal block time of 2.5 minutes – faster than litecoin. Like bitcoin and most other major cryptocurrencies, but unlike the existing Litecoin network, litecoin cash will use the more energy intensive, but potentially more secure, proof-of-work mining method. The fork will occur precisely at block 1371111. The Litecoin network is currently on block 1368028 at the time of writing,according to BlockCypher. The fork is expected to occur sometime around 9 p.m. ET on Monday, February 19. Litecoin, which was designed to be less energy intensive than bitcoin, saw an astronomical rise in 2017. The cryptocurrency skyrocketed from just $US3.73 a year ago, to as high as $US365 in December, leading founder Charlie Lee to warn investors about the possibility of losing everything. He also sold his entire stake after being accused of price manipulation. Forks aren’t uncommon in the cryptocurrency world, although they are not without controversy. Bitcoin cash famously split from the flagship bitcoin in August 2017, but the forked cryptocurrency has been accused of merely riding the coattails of the more established bitcoin. 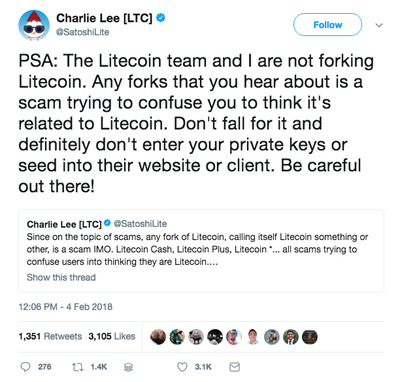 Business Insider could not verify any individuals behind the Litecoin Cash Foundation, which does not claim to be related to litecoin in anyway. The organisation’s website lists four team members, with no credentials or last names. Litecoin holders who wish to claim their share of litecoin cash can follow instructions listed on the litecoin cash website.